We warmly invite you to use our services related to integration events. We pay special attention to the military climate events that will appeal not only to fans of military footwear, rigor and camo color clothes. What should you know about these types of events and what should you prepare for? A military integration event is an opportunity not only for a common going out with people who we generally know only from work and with whom we often exchange only employee information, but also for getting to know them from a completely different side. These types of events can be based on many items that require not only the efficiency of the body, but also the fortitude and thinking – all depends only on the assumptions that the event is supposed to respond to! A bachelor party – a tank ride? For us nothing is impossible. We are able to organize not only an integration event for two hours, but also a military-style bachelor party that will give all invited guests a real, male feel. Is that not the goal of every bachelor party? Heavy equipment, a tank ride, a survival atmosphere, and good fun during a Paintball group duel. 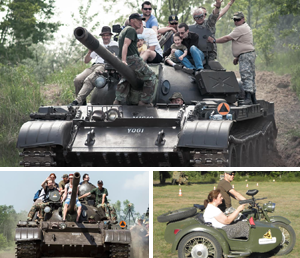 In conclusion, military events they are becoming more popular and can provide memories for a lifetime – not many people can say they rode a tank! Is it worthwhile to limit your memories only to standard ideas and boring integration events? Or is it better to bet on something that will actually integrate the playing people? The following offer is only an example of attractions that we consider to be an inspiration.